HomeAnalysisPensions Now Depend on Bubbles Never Popping … But … All Bubbles Pop! The nice thing about the “wealth” generated by bubbles is it’s so easy: no need to earn wealth the hard way, by scrimping and saving capital and investing it wisely. Just sit back and let central bank stimulus push assets higher. 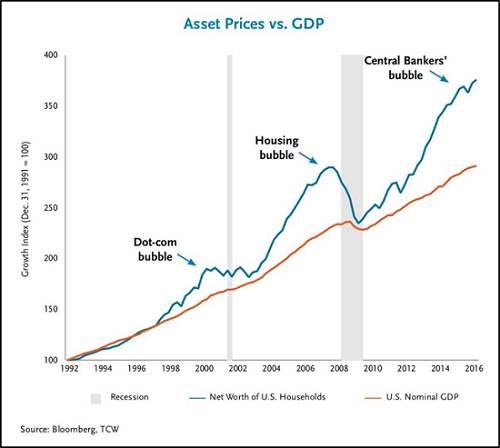 The problem with bubble “wealth” is it’s like an addictive narcotic: now our entire pension system, public and private, is dependent on the current bubbles in stocks, real estate, junk bonds and other risk assets never popping. 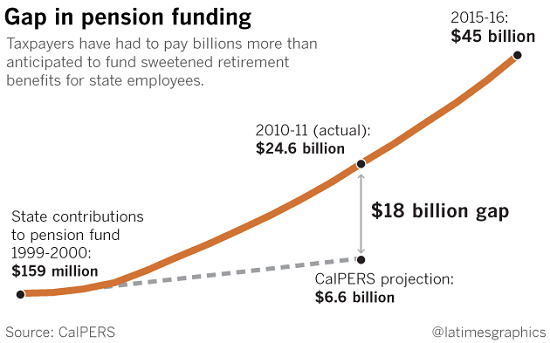 Take a look at the chart below of taxpayer contributions to Calpers, the California public pension fund. Note that in the heady days of Bubble #1, the dot-com era, enormous gains in Calpers’ stock holdings meant taxpayers’ contributions were a modest $159 million annually. 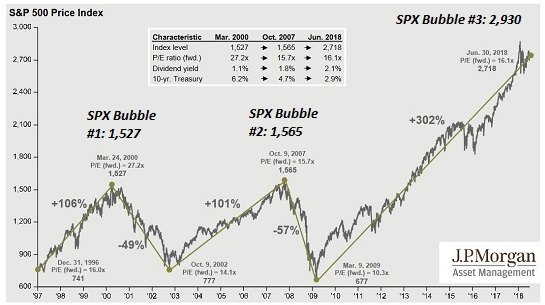 Here’s a chart of the three stock market bubbles. 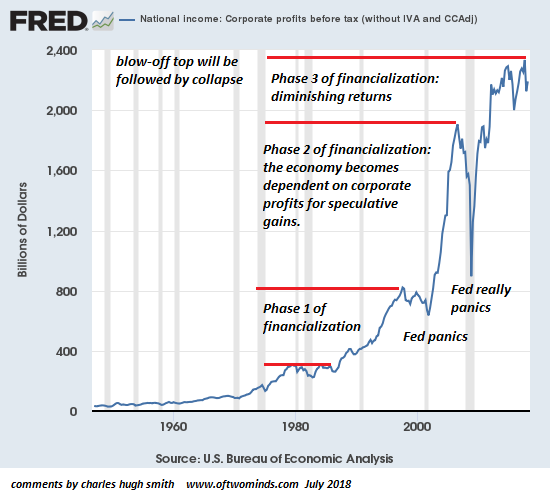 Note the current bubble is the most extreme bubble. Private retirement assets (401Ks and IRAs) have bubbled higher, creating the temporary illusion of a “safe, secure” retirement because hey, past bubbles popped but the current bubble will never pop because the Fed won’t let it pop. We’re living in a fantasy, folks. Bubbles pop, period. The Dow and SPX rose week after week and month after month in the 1999-2000 bubble, and again in the 2007 bubble, and so did junk bonds and housing. Everything rose in lockstep, lending support to the magical-thinking belief that this bubble will never pop because (insert excuse of the moment): housing never drops, the Fed has our back, etc. Bubbles pop. To avoid this reality, commentators claim this is not a bubble. Since it’s not a bubble, it won’t pop. But calling a bubble not-a-bubble doesn’t mean it’s not a bubble. Wordplay doesn’t change reality. 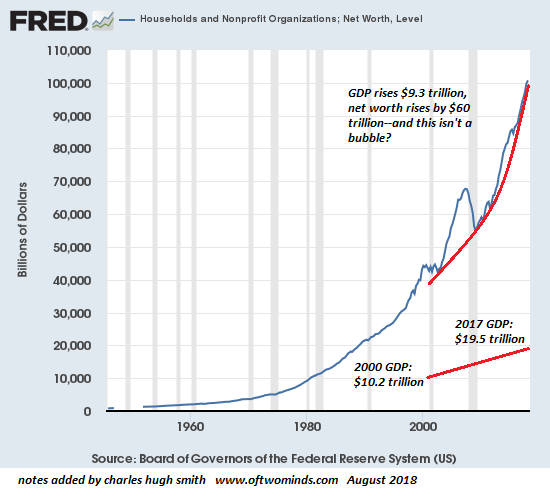 This article (Pensions Now Depend on Bubbles Never Popping (But All Bubbles Pop)) was originally created and published by WashingtonsBlog and republished here with permission and attribution to author Charles Hugh Smith and WashingtonsBlog. Charles book Money and Work Unchained is now $6.95 for the Kindle ebook and $15 for the print edition. If you found value in this content, please join Charles in seeking solutions by becoming a $1/month patron of his work via patreon.com.